Ever since I first reeled in a shiny, striped, blue-green mackerel from the sea, I've been (excuse the pun) hooked on fishing. Mackerel is sustainable, good for you and one of the fish given the green light for us all to eat on the Fish Fight Campaign. It's also, luckily for me, very easy to fish. Having tasted shop-bought mackerel, there really is no comparison between that and a fish that was darting and diving in the sea only a few hours before. 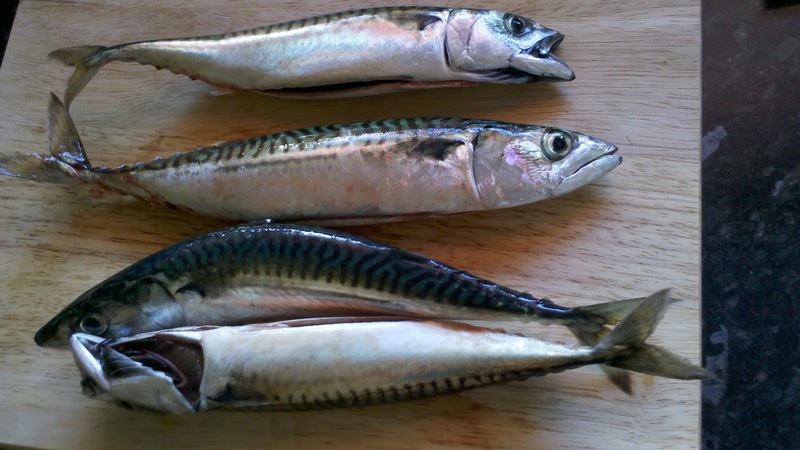 As mackerel is an oily fish, it deteriorates quite rapidly after fishing, and to try it at its very best I urge you to try fishing for it yourself. To do this, we jump on board our friend Steve's boat The Crusader II- Steve runs fishing charters just off Gosport, on the South coast of the UK - and he has such an immense knowledge of fishing that it's great just to be out on the water with him. He also makes a decent cup of tea, to be sipped while you bob about on the sea, competitively watching the end of your rod for that flicker. My husband went out on one of these trips recently and brought back a few mackerel for our dinner. Normally I grill them as they are, maybe with a little sea salt and olive oil, and eat them plain. But I just had the urge to do something else with them this time. They're really full of flavour and have quite a rich, oily taste so they can stand up nicely to a sticky, sweet and savoury teriyaki marinade without you losing the flavour of the mackerel underneath all that blistered, crisp skin. We eat our Japanese-style mackerel with plain fragrant rice and stir fried greens. You can buy a teriyaki marinade for this, but it's also easy to make yourself if you keep soy sauce and mirin in the cupboard. Mix the soy and mirin together and heat gently in a small saucepan. Add the sugar and stir gently until it is dissolved. 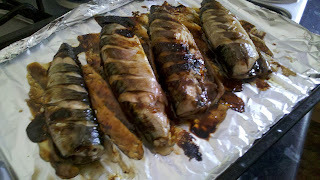 Let it cool down while you prepare the mackerel. Lay the mackerel on a board and make slits in the skin, on both sides of the fish, with a sharp knife. Don't go all the way through the fish, it's just to allow the sauce to get underneath the skin. Place the mackerel on a grill (it gets messy so foil is a good idea here) and pour the sauce over the fish, making sure you get it into the slits you just made in the skin. Cook under a medium grill for about 10-15 minutes, making sure the fish is flaky and cooked through. Turn the fish over halfway through cooking, spooning over more marinade if you think it needs it. these teriyaki mackarel tastes awesome! I love them so bad!